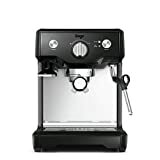 The Sage by Heston Blumenthal BES810BSS Duo-Temp Pro Espresso Machine is a manual espresso machine that doesn’t disappoint in quality or simplicity. 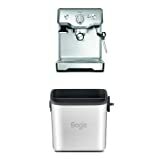 It’s a reliable purchase and perfect for anyone wanting to make perfect espresso and latte with ease. As you’d expect (from a detail-orientated chef like Heston Blumenthal) the Duo Temp Pro Espresso Machine makes total sense for making quality espressos at home. Equipped with a milk wand on the side of the unit, that steams with a 15 bar pressure, making texturing milk is a breeze. It takes roughly 20 seconds to froth milk, making it ideal for anyone wanting to make lattes. Quickly. Be prepared for a quite a bit of noise in the process though. The milk wand also transforms into a hot water tap with the push of a button meaning you can create a range of coffee styles from espressos and flat whites to cappuccinos and long blacks. See also: The Best Coffee Machines of 2018. 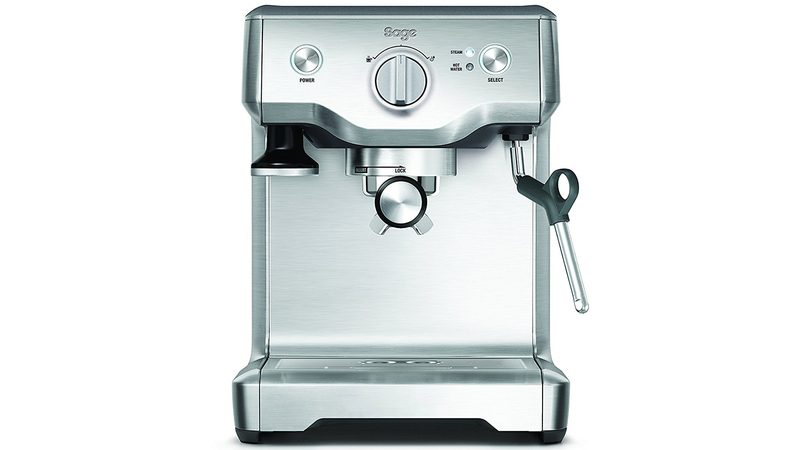 Unlike its big brother, the Sage by Heston Blumenthal BES870UK, the Duo Temp Pro Espresso Machine does not have an in-built bean grinder. This does mean you either have to purchase an add-on grinder, like Heston’s Smart Grinder Pro Coffee Grinder, or the Dose Control Pro Coffee Grinder or something cheaper like De’Longhii’s Professional Burr Grinder if you want to capture the flavour of a bean-to-cup coffee. Alternatively, you can simply purchase filter coffee. When it comes to actually making the coffee, it’s very simple. Insert the portafilter into the supplied group head, fill it with ground coffee, tamp lightly with the integrated magnet tamper, skim with the provided Razor Precision Dose Trimming accessory, lock it into place then turn the control dial to espresso and you’re done. The Duo Temp Pro Espresso Machine is also uniquely equipped with an electronic PID temperature control which ensures the water temperature is of high commercial quality, which means users never burn their espresso, resulting in balanced flavours in every time. Cleaning the Duo Temp Pro Espresso Machine is also very easy. It is equipped with features like a ‘Full’ indicator light that tells you when the removable drip tray needs emptying. There’s also an inbuilt scale filter in the water tank to reduce scale build up and the unit also comes with a cleaning kit. So while it’s not automatic, you are given the tools to keep it clean. See also: The BEST Capsule Coffee Machines 2018. The look of the Duo Temp Pro Espresso Machine is basic but clean. It isn’t cluttered with accessories and flashing lights. It’s simple, straightforward and minimalistic which means it can merge into the background of any kitchen unobtrusively. It’s solidly built with a bit of weight to it, so you know you’ve bought a sturdy, reliable machine as soon as you lift it out of the box. The designers have accounted for those of us who like our coffees in mugs (not cups) and have built the Duo Temp Pro to cater for extra-tall cup heights. This is also apparent in its massive 1.8L water tank which means you can make several cups of coffee before refilling the removable tank. Its in-built scale filter is a really great addition that many competing machines are lacking as the better the quality of water, the better the taste of your coffee. With dimensions of 26 x 30 x 33 cm, the Duo Temp Pro Espresso Machine is a relatively standard size for what it offers. It’s not the most discreet machine, but its colour scheme (silver or black) will integrate seamlessly with most kitchens. A great feature is that you can store the portafilter accessories under the removable drip tray, keeping things neat and tidy. 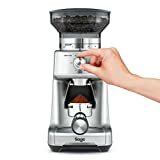 The Sage by Heston Blumenthal BES810BSS Duo-Temp Pro this is an excellent mid-range manual espresso machine, perfect for anyone wanting to make barista-quality espressos. Its simple and straightforward design will look great in every kitchen. And, providing you know what you’re doing, the Duo-Temp Pro will enable you to make highstreet cafe-quality coffee in the comfort of your own home. Read next: The BEST bean-to-cup coffee machines of 2018.